Some of my collages are created with fabric. 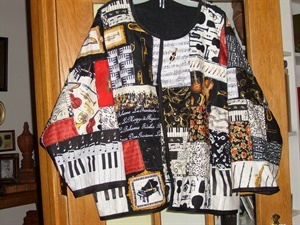 I make both wearable and non-wearable fabric art. 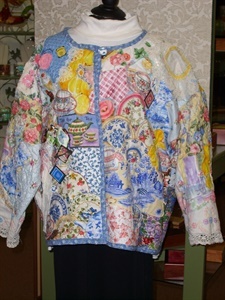 This jacket consists of layers of fabric with a tea party theme. Cups, saucers, tea pots, sweet treats, doilies, etc. overlap with heavy quilting. Pins made from tea bags and spoons are accents. 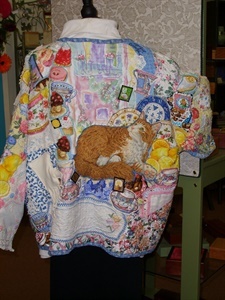 This shows the cat (heavily quilted to mimic fur) and some of the doilies and treats. 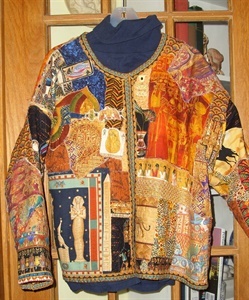 This piece uses Egyptian motif fabrics for the collage and is heavily quilted with gold thread. It uses a scarab pin. 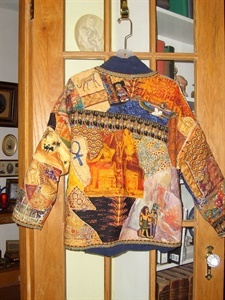 This is the back of the jacket and shows more of the Egyptian themed fabrics. It takes about 25-30 fabrics to do a good design. 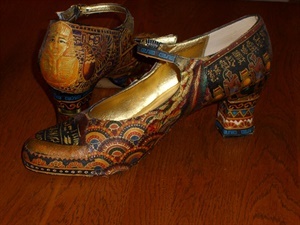 The left over Egyptian fabric was collaged to leather shoes. 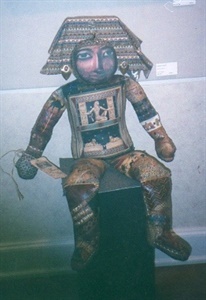 To be worn with the Egyptian jacket. This is a simple jacket which just uses rectangular shapes. The edges are left unhemmed so it will fray. I love this Edna St. Vincent Millay poem and wanted to illustrate it in fabric. The burning earth is at the bottom with the blue flag iris; the road to Heaven with the people walking upward, and the poem is printed on silk and sewn at the left side. 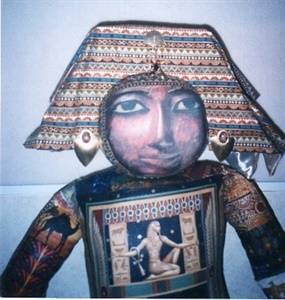 This Egyptian boy king was created with the same Egyptian fabrics that I used on my jacket and shoes. He is heavily collaged and has golden ear rings. I printed an Egyptian death mask on silk to use for the face. 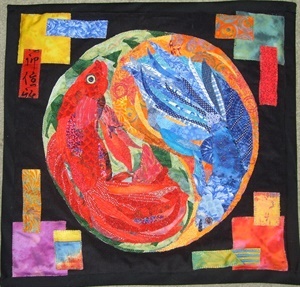 This is a quilted panel with two beta fish in a yin yang circle. The red fish is sewn with gold metallic thread and the blue fish uses silver. 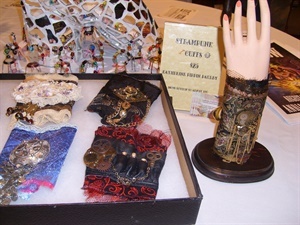 I started making Steampunk cuffs with chains, watch parts, vintage jewelry and lace. This fabric cuff has vintage watch parts and chain. 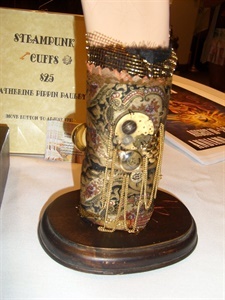 This cuff is made with a black kid leather overlay which holds 3 vials and a key. 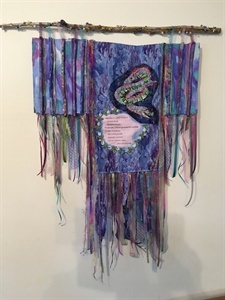 Hand embroidered dragon on batik background; side panels are watercolor strips alternating with covered cords; branch bar is wrapped with gold wire covered with faux gems and gold mini beads; finished with a variety of ribbons. The old Gumbie Cat from the T. S. Eliot poem is sitting while the mice are playing. 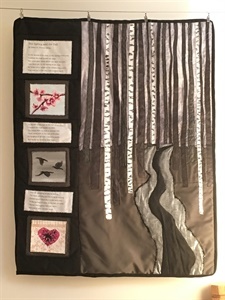 Edna St. Vincent Millay’s poem is the theme for this fabric wall hanging. The illustrations for each stanza are done in watercolor.